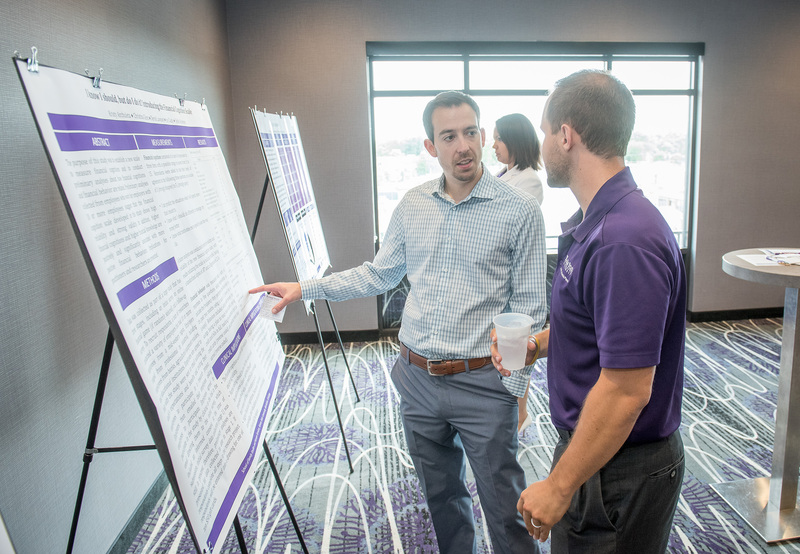 The 3rd annual K-State Personal Financial Planning Practice-Oriented Research Poster Forum was held at the Bluemont Hotel in Manhattan, KS on August 3. This is an opportunity for doctoral students to showcase their research projects. 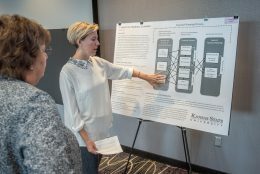 Students may have presented these research projects at an academic conference during the previous academic year or are planning to present them in the upcoming year. One of the major objectives of the poster forum is to provide a place where practitioners and researchers can interact in order to help connect research and practice. Students have to articulate the implications and practical usefulness of their research without using academic jargon. Feedback can be provided by attendees to help further inform the researcher’s project. 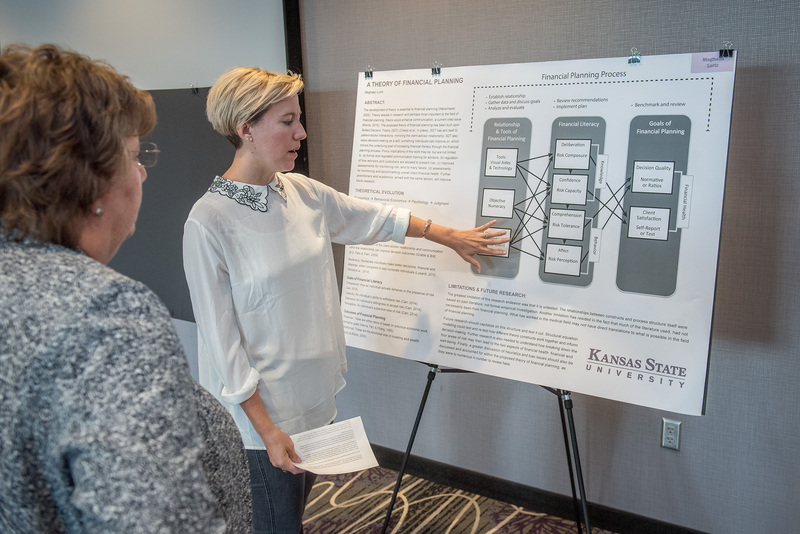 1st place: “Federal Student Loan Entrance Counseling: Student Perceptions and Influence on Anticipated Debt Burdens” by Somer Anderson, Stuart Heckman and Derek Lawson. and Julie Cumbie, Ph.D. 2012 alum. We are thankful for these generous entities and individuals and their commitment to helping our doctoral students succeed. 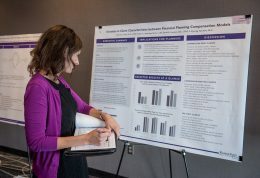 Judges from both practice and research evaluate the posters and decide the top three posters. The judges comment each year on the difficulty to make a decision because the research judges are looking at different aspects than the practitioner judges. In the end, judges select high quality research that is relevant to practice. 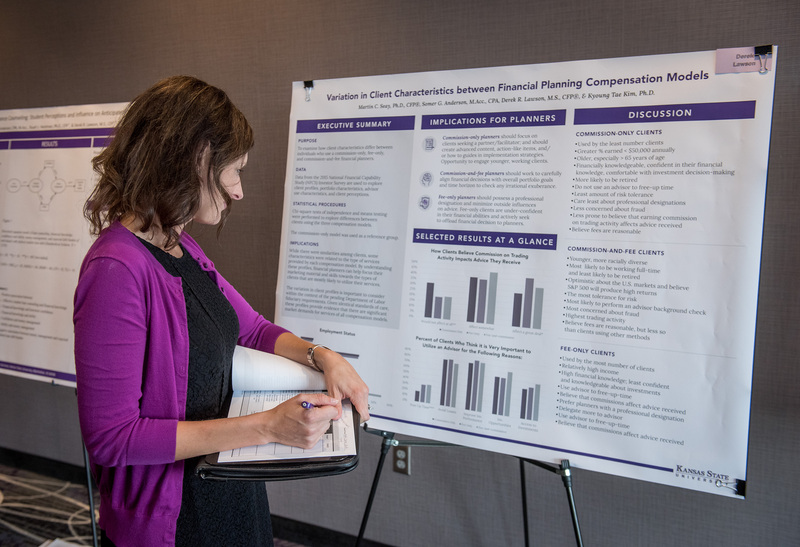 Judging this year were Ms. Jamie Bosse, KHC Wealth Management; Dr. Bronwyn Fees, K-State College of Human Dean’s Office; and Ms. Amy Guerich, Stepp & Rothwell, Inc. We are appreciative of these judges’ time and willingness to read each poster and interact with the student presenters.